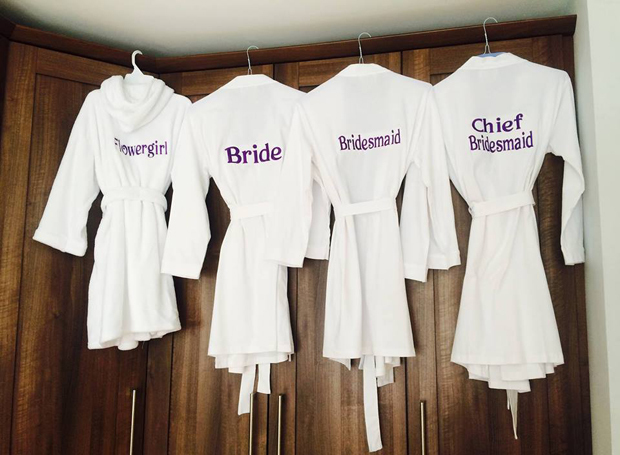 WowWee.ie have been providing stylish bridal parties with gorgeous robes for the past 15 years and their collection is divine! 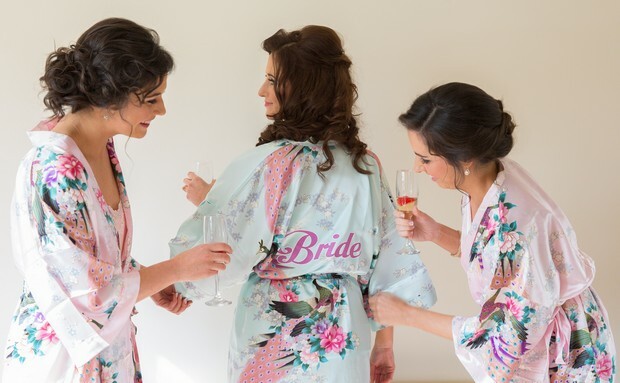 They have their own range of personalised bridal robes in a pretty satin floral print as well as plain satin and a cosy towelling version. And they stock ‘bride’, ‘bridesmaid’ and ‘flower girl’ hoodies too if you’re after some extra warmth! Shop their gorgeous range here. 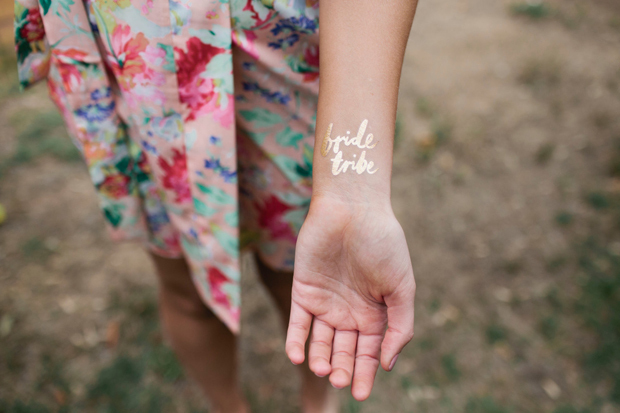 If you’re looking to deck the bridal party out in personalised goodies for the wedding morning, pop over to Simply Personalised Embroidery. 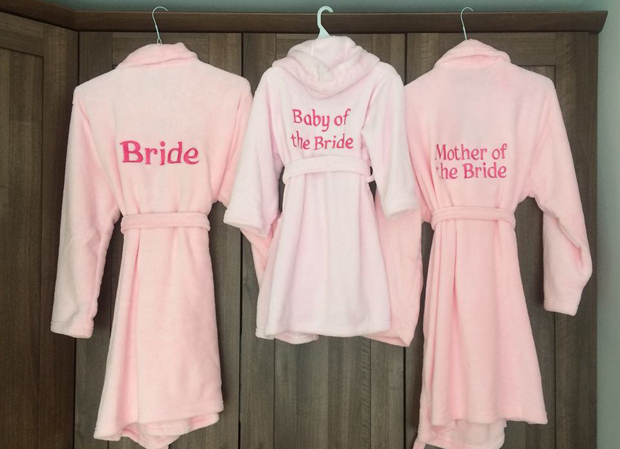 They specialise in beautifully embroidered gifts and clothing that can be personalised to perfection including all manner of robes – fluffy, light cotton, towelling and waffle. Robes are made to order so you can have anything you like embroidered on them. You can pick up personalised hoodies and slippers too as well as robes for kids! See their amazing range here. 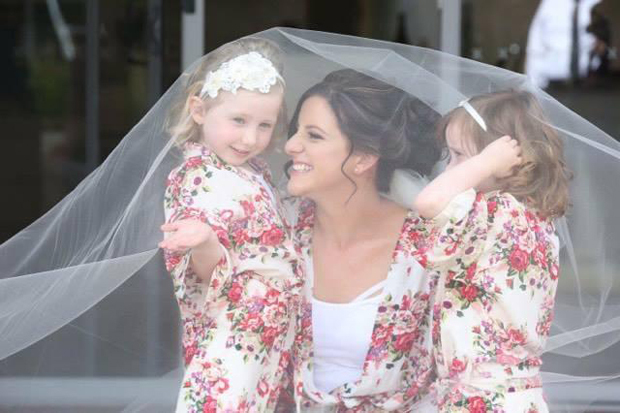 If you’re on the look out for pretty floral robes for the girls or indeed your little ladies – the flower girls, stop by wedding store – The Lovely Little Label. 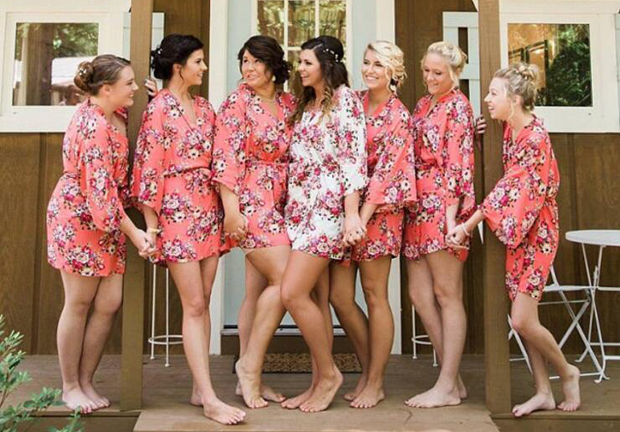 They stock fab coral, navy, blush pink and ivory satin floral robes for the bride squad as well as luxurious slippers and lots of other beautiful gifts and accessories to make your day special. Shop the beautiful collection here! This family run business have offices in Dublin and London and have every type of robe imaginable – fluffy, satin, waffle and lightweight jersey cotton in lots of lovely colours. Robes4You stock PJs too if you’re more of a jammies gal as well as slippers. Their robes and PJs come personalised to perfection in the prettiest gift boxes so they’re all ready to go if you’ve picked them up as gifts! See the fab range here. Online store Engaged Apparel have so many pretty accessories for brides and some divine robes too. They stock elegant lace kimono styles, both plain and floral satin robes and satin gowns with a lace trim. 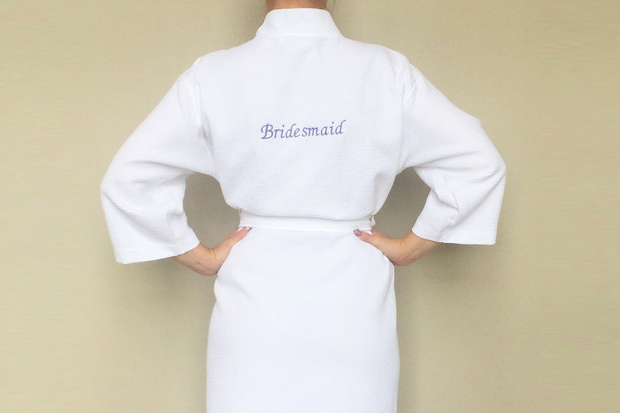 Robes come with a personalisation option too – you can have your name or title printed on the front, back or both! Take a peek at the gorgeous range here. 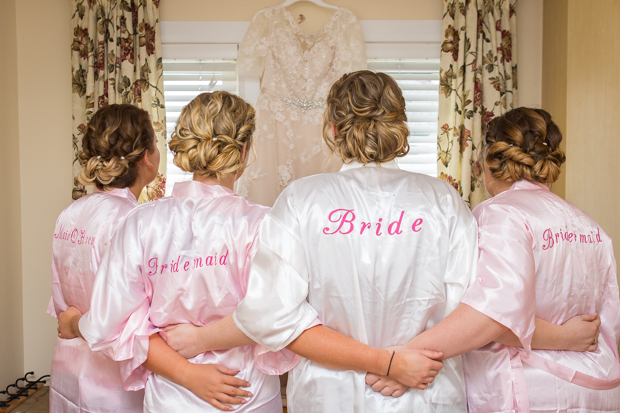 Dainty Robes is an online store based in Tyrone that can deliver beautiful bridal robes to you and your girls. 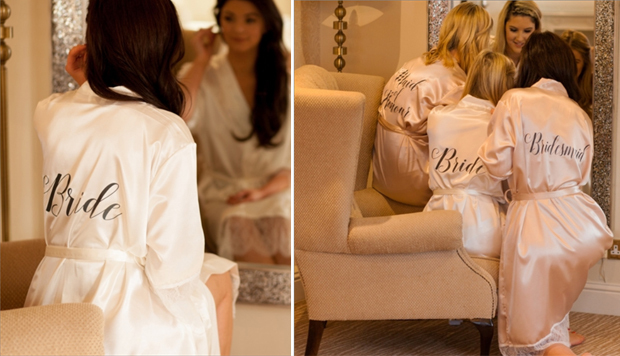 Their luxury personalised robes are 100% cotton waffle weave so they feel super comfy and look amazing too. 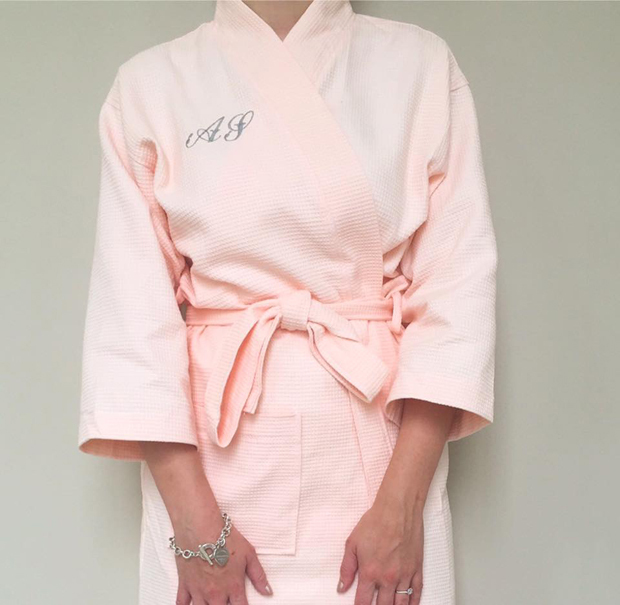 All robes can be personalised with each bridal party members initials to the front and their role (Bride, Mother of the Bride etc.) on the back if you fancy too. Browse their pretty styles here.